Who hasn't grown up watching some version of Dicken's A Christmas Carol? And I suppose even a few may have read the book. 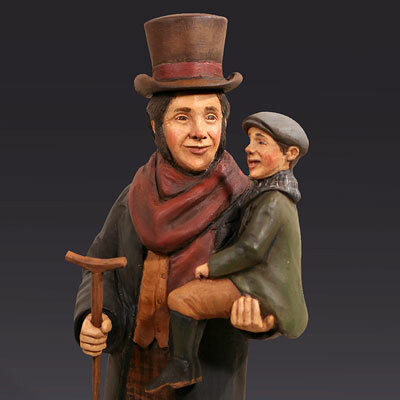 It's these memories of many childhood Christmas's that inspired me to create Bob Cratchit with Tiny Tim. Everyone has their own nostalgic feelings for these characters, and my goal as an artist is to spark these feelings through my version of these, and other characters of the Dickens classic. Like all of my carvings, this piece is hand carved from basswood, then painted with multiple layers to create age and warmth. This piece, as is most of my work, is available for special order.